In M+R and NTEN’s most recent eNonprofit Benchmarks Study, we found that although high dollar donors make up fewer than 2% of online donors, their gifts make up more than 18% of funds raised each year. And while many organizations receive large gifts through email and passive web fundraising, few organizations have a 4-digit donor strategy as part of their online programs. But imagine how many 4-digit gifts you could get if you really asked for them? M+R has worked with the Human Rights Campaign (HRC) on a successful online strategy to recruit new members for its high-dollar donor program, the HRC Federal Club. Federal Club members donate at least $1,200 annually, either through one single donation or via a monthly gift of $100 or more. We’ve learned a few notable things over the years – for example, during our first Federal Club recruitment campaign, we didn’t see much of a response until the final message of the series. Had we given up early, we would have missed out on over $25,000 in revenue. This paper outlines a few key tips from three years of campaigns to recruit 4-digit donors to HRC. Use them to hone your program or start one for the first time! Use past donation data to identify donors who won’t be turned off by an ask for a large donation – and who will be more likely to respond. Those supporters who bought a ticket for a fundraising event in the past 3 to 9 months, or who have ever made a gift at a fundraising event other than buying a ticket. (Don’t forget to suppress current high-dollar donors, those who have recently canceled, and any major donors who should be contacted personally for larger gifts). Over the past three years, HRC’s audience has evolved based on previous message performance. Once you run a 4-digit donor recruitment campaign, it’s important to take a look at the giving history of those who ended up accepting the offer so that you can refine the audience for next time and drop any clearly non-responsive segments, as well as identify any successful criteria where you could dig a little deeper. Now that you’ve identified your audience, how do you get them to open their wallets? Tell your prospective major donors why it’s important for them to give today and make your case with specific reasons why you need this money to focus on new threats or opportunities, using hooks from the news and recent events. If there is an opportunity to coordinate with the timing of a direct mail appeal or telemarketing campaign, you should! The messaging doesn’t need to be exactly the same; receiving an ask from each channel will reinforce the message in the other. It’s important to run the major donor program like any other campaign – which means sending multiple messages over a short period of time that focus on a specific goal and deadline and use an urgent, timely ask. Each year, the second or third appeal in the HRC Federal Club series garners the strongest response. We also recommend giving those who didn’t fit the invitation criteria a chance to join. HRC promoted the campaign in its monthly full-list eNewsletter and in a weekly insider update from HRC’s president, which goes to volunteers, monthly sustainers, and local leaders. These two promotions recruited more high-dollar donors than the first standalone appeal! Premiums can go a long way. Just be sure the premium is appropriate – giving away a tote bag for a 4-figure gift doesn’t quite jibe! Since this is such a small group of people giving a generous amount, it is easier to fulfill more expensive gifts – we’ve used a branded flash drive, a high-end umbrella, and a wireless mouse. For years, HRC has found success in branding its Federal Club program and offering real membership benefits such as a free magazine subscription, invitations to exclusive events, reduced dinner tickets, and a listing in the annual report. The members of the Federal Club are also treated as part of the brain-trust of the organization, so throughout our messaging we make it clear that they will be given the opportunity to offer ideas and give input to decision-makers in the organization. How will you recognize the significant contribution of these high dollar donors? Be sure to list these membership benefits in your appeals! How to get them back. If you’re bringing in new donors but leaving lapsed donors out of the loop, you’re missing out on revenue. 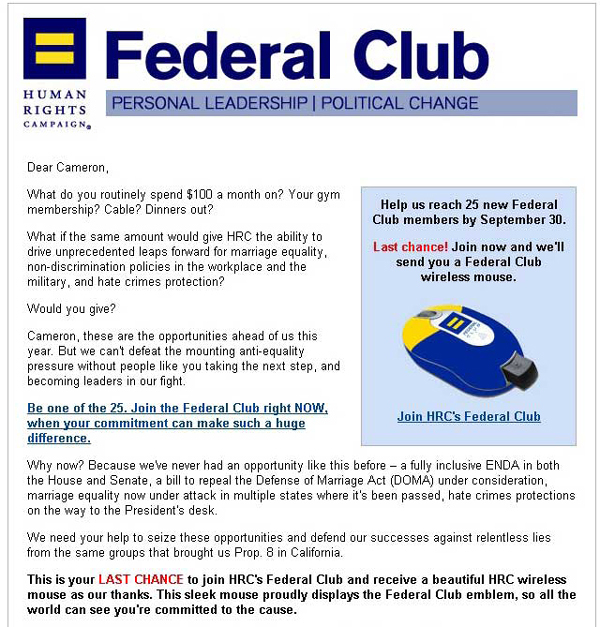 In addition to a yearly Federal Club series, HRC also offers the premium to lapsed Federal Club members, using much of the same messaging about why their support is so important and asking them to return. Most recently, we launched a two-message series that re-engaged 14 former Federal Club members. If you have questions about this study, or if you would like to discuss your organization’s online fundraising strategy, please don’t hesitate to get in touch with us.